CHANT will be implementing online booking functionality to our website in the very near future. To book this tour and any other tour offered by our tour providers, please contact us by phone or by using our email form. Ridge to Reef Farm is an organic certified eco-farm committed to providing the territory and its guests the highest quality food and farm experiences possible, grown with love on St. Croix. The farm hosts a healthy 100-person Community Supported Agrilculture (CSA) seasonal program, serving residents across the territory. Ridge to Reef also hosts www.vi.locallygrown.net, a web-market for visitors and residents that represents over 8 sustainable growers and craft makers. Pick-ups for this "pre-sell" market and a weekly "extras" are sold on the Lawaetz Family Museum grounds every Wednesday from 4-6pm. 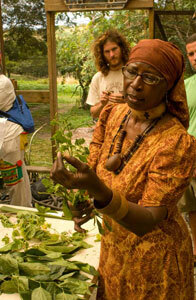 In addition, Ridge to Reef offers tours, farm stays, farm food events, groups retreats, and educational programs! Contact us about making a reservation for a tour, a farm stay, or a special food event! World Class Eco/Agro-Tourism Destination: Ranked as a top global sustainable tourism experience by Islands Magazine, Coastal Living, and National Geographic's Center for Sustainable Tourism Destinations. Tour Description: Upon arrival at the Farm's solar-powered Community Center, visitors receive the Farm Crew welcome and a run-down of optional tour activities (below). Visitors can simply relax at the Center to enjoy entertaining cultural demonstrations, try their luck in the fishing pond, or join a guided farm tour. Local refreshments are provided. Provisions: Tropical beverages, and purified water.